Paul Hogan and John Wayne - let alone Crocodile Dundee and G. W. McLintock - are very different characters, but they're both heroes in their own way and despite their vast differences in backgrounds (let alone eras!) they draw on many of the same strengths to live their lives. Both are straightforward men, competent, at home in their environments. They're honest and decent and, while McLintock is more a leader and Dundee more of a loner, you feel you could do business with either and not fear being cheated. And they're both men worth emulating. Dundee, whose first two movies are out in a Blu-ray double pack from Paramount, became a phenomenon when he first hit the world's screens. Paul Hogan had been known for his Australia tourism and Foster's beer commercials as well as his comedy TV show, but from that comparative obscurity he was shoved into the limelight with this first Dundee movie, a gentle and humorous "fish out of water" story in which a supposedly larger than life bushman from the Australian outback and a jaded American reporter both get to experience life far outside their comfort zones. Well, that's not really true of Mick Dundee, who seems perfectly comfortable wherever he finds himself, even when surrounded by pompous Manhattan asses who think they're so much superior than the plain-spoken man who dresses and sounds so funny. Dundee makes friends among "regular people" wherever he goes and has a kind of innocent but not blind to reality worldview. He looks for the best in people, though he's also perfect aware of when he doesn't find it. Really, he's the kind of guy you'd follow into battle, if he ever were to head in that direction. Not unlike the Duke. The first Crocodile Dundee is delightful and, while not really a knee slapper, should definitely put a smile onto your face - and who can forget the classic scene in which he's being threatened at knifepoint. Hogan is likable as Mick, as is Kozlowski as Sue, the intrepid scribe with enough character to allow her eyes to be opened on a wider world - of places and people - unlike many of her peers. Crocodile Dundee II picks up shortly after the first movie, with Dundee living in New York but getting antsy and wanting to find something to do with his life. Meanwhile, Sue's ex-husband, a photographer working in Colombia, is killed - but not before he manages to mail an incriminating roll of film to Sue (shades of "Romancing the Stone?"). Guess who they go after. 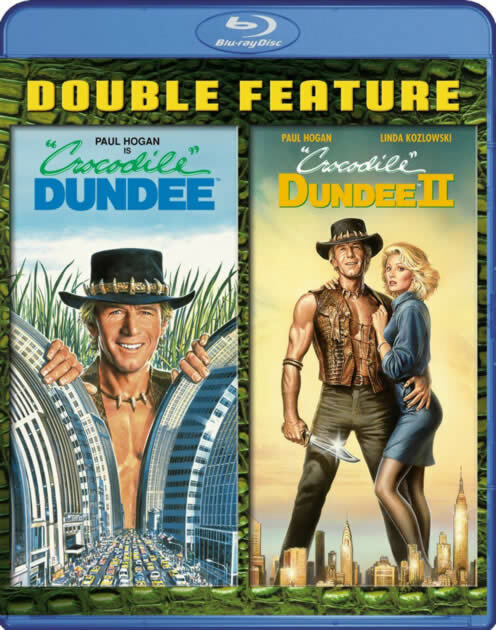 It's a pretty good movie, but if you're expecting "Crocodile Dundee II," you may be a tad disappointed to find that it's more "Mick Dundee, Superhero" as our favorite Aussie singlehandedly tracks down the thugs and saves Sue's life. The action once again moves from New York to Australia again as Mick takes Sue back to where everyone else will be the fishes out of water, but rather than being a gentle comedy like the first movie, this one's a more serious adventure. Oh sure, you can't help but like Mick and Sue, and we get to see more of the Walkabout Creek gang than before, but it doesn't make up for what feels like a completely different film. Video quality is good for both titles, though it isn't the stuff that'll make your friends go "ahhh!" when you fire up the picture on your big screen. But it's engaging, bright, colorful and detailed, and obviously the best video version yet. Ditto for the sound. Alas, you can forget about extras except for the trailer and a very short and pretty superficial "making of" for the second film. G.W. McLintock, meanwhile, is also larger than life, but how could a John Wayne character not be? Pair him with the wonderful Maureen O'Hara and you're practically guaranteed a home theater hoot. O'Hara seemed to bring out the best in Wayne as an actor, and her characters were generally great foils to his. Here, which supposedly is a retelling of "the Taming of the Shew," Wayne's McLintock is an Arizona cattle baron who has enough troubles in his life without his estranged wife (guess who) coming back to get divorce papers signed so she can take their daughter (a very young Stefanie Powers) with her to flit about the social circles back east that mean so much more to her than the rough and tumble life in the territory. G.W. isn't biting, though, and over the course of the film tries to convince Kate to stick around. He doesn't do this so much by romancing her, as by just being himself, big and brawny and boozy, but oozing with character and manliness she discovers she has missed in the fleshpots of high society. There are subplots galore and some great supporting cast performances from western staples such as Chill Wills and Edgar Buchanan, and some nice work by Patrick Wayne, Strother Martin and Jack Kruschen, as well as an interesting geek bit by Jerry Van Dyke as a suitor for G.W. and Kate's nubile daughter. Oh, and don't forget Yvonne "Lily Munster" de Carlo as McLintock's new cook and part time foil for Kate. This movie is definitely not politically correct - and that's a good thing, though some younger viewers who've never experienced culture before the tolerance and inclusion and free speech gang forced intolerance and exclusion and fear to speak onto society. Perhaps you could look at it as a throwback to a more civilized (unless you're a lefty) time. It's also full of positive messages about the benefits of freedom, capitalism, and managing your own life. There's also a brief slap at bureaucratic efficiency as a bunch of farmers show up to claim their free government land, only to be given a reality check that the land they were promised is more suitable to grazing than raising. And what would such life lessons be without jealousy from those who haven't earned as much or worked as hard as McLintock did to build his empire. Paramount's Blu-ray is excellent. The picture is quite stunning and looks as if they shot it yesterday (though much of the cast looks far better than if it actually were made yesterday!). There's some grain and a few flaws, but they're minor and in no way spoil this gorgeous presentation. There's also a decent Dolby TrueHD 5.1 lossless soundtrack, but don't expect a reference quality surround experience. First of all, it's mostly front-centric with little if no surround. But that's what you often get with a film of this age and taking that into account I can't complain about McLintock's audio. You get lots of extras, from an introduction by critic/fan Leonard Maltin, to an audio commentary featuring Maltin, Frank Thompson, Maureen O'Hara, Stefanie Powers, Michael Pate, producer Michael Wayne and Director Andrew McLaglen. It's very good. A "making of" feature in three parts is also pretty decent, and there's a couple of interesting shorts, too. One, "The Corset: don't leave home without it" looks at - well, you'll just have to guess. The other "Two minute fight school" shows how they mount a movie fistfight. You also get a photo gallery and the trailer. Despite McLintock's more advanced age, it has stood the test of time better than the Crocodile Dundee movies, perhaps because it has a better cast and a better story. 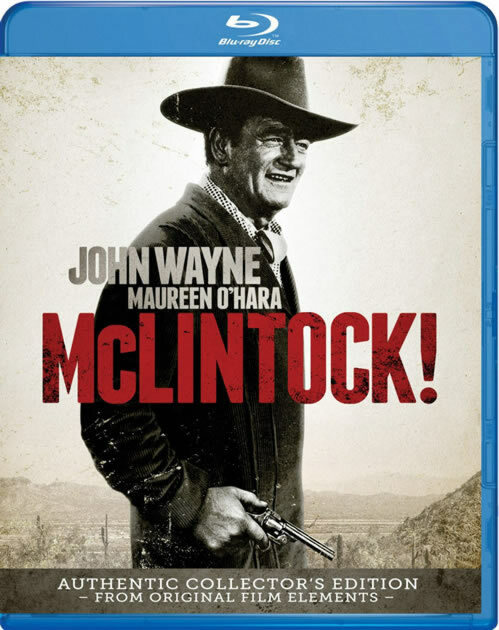 But all three films are worth a look, though McLintock is probably also worth adding to your library.